Take a bowl add all ingredients except oil & mix well. Batter should not be neither too think nor thin. Heat tawa , add little oil and grease it. Take one laddle of dosa batter , make medium size dosa. Add oil around the dosa & cook it both sides. வெள்ளரிக்காய் தோசை பற்றிய செய்தியே புதிது. செய்முறைகள் அருமை. பகிர்வுக்கு நன்றிகள். Please Remove the "word verification" immediately from your Blog, which will give irritation to the followers & comment writers. "WORD VERIFICATION" என்று நந்திபோல நடுவில் இருப்பது, ஆவலுடன் பின்னூட்டமிட வருபவர்களுக்கு மிகுந்த எரிச்சலைத்தரக்கூடியது என்பதை தயவுசெய்து உணரவும். You are right sir. before i got some unwanted comments. i removed the word verification now. Thank you very much, Madam. All the Best. Have a Very Nice Day. Delicious and wholesome looking dosa. A very colorful preparation. 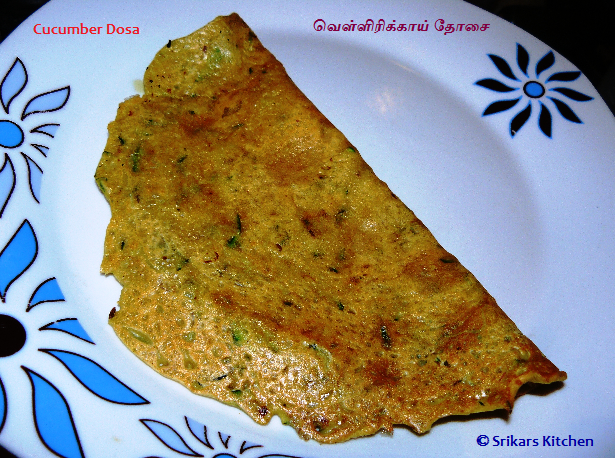 Love this kind of instant version of dosas, excellent food. Lakshmi shrinath- The smell of cucumber & gram flour sounds good. Wow, its really creative and thumbs up for the outcome. I am trilled and excited to see such a dosa. Btw, the word verification is keep away spammers. If you remove them, your blog can be attacked with loads of spam mails and in the long run, it can bring in virus too. Thank you for your lovely comment & lovely advice.Now i removed word verification now. Suppose if i am getting some unwanted mails, again will set up. Looks healthy & yummy dosai...Nice click!